Kidney stones can form in urine when minerals and other substances come together to make crystals. They are usually uneven and patients have severe pain. Though, patients are suffering from Kidney stones since many decades but it increasing at rapid rate over the last 30 years. 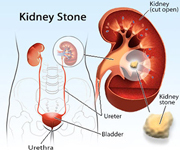 Kidney stones are made of salts and minerals in the urine that stick together to form small stones. These stones are of different sizes. It can be too small as grains of sand or too large as balls. These stones usually remain in kidneys or travel out of body through the urinary tract. There are several types of kidney stones: calcium stones (80%), struvite stones (15%), uric acid stones (5%) and cystine stones (2%). Calcium stones are usually a combination of calcium and oxalate. Struvite stones are usually seen in urinary tract infections. Uric acid stones can be seen in people with or at risk for gout or who have received chemotherapy. Cystine stones are rare and usually result from a genetic disorder. A kidney stone formation is due to a change occurs in the normal balance of water, salts, minerals, and other things found in urine. The most obvious reason for kidney stone formation is not drinking water in adequate amount. The Risk Factors associated with kidney stones-There are number of conditions that increase risk for stones. If person have a family history of kidney stones or genetic disorders predisposing to them, he is at greater risk. If person is between the age of 20 and 60, male, and live in a hot climate, he is also at increased risk. Certain medical conditions, medications, and diets can also form to stone formation. Symptoms Kidney stones generally do not show symptoms unless they cause bleeding, an obstruction, or a contagion. An obstacle causes pain; it may be mild or sometimes very severe and possibly decreased urine output. If there is an infection, it results in fever, chills, cloudy urine, a persistent urge to urinate, or pain with urination. When patient show these symptoms, he may become sick and repeatedly vomit. When a patient feels severe pain his back or side that will not go away, blood in urine, fever and chills, vomiting, urine that smells bad or looks gloomy , a burning feeling when he urinate, it signals that he immediately need a doctor's guidance Diagnosis-A kidney stone should be assumed when patient feels unexpected pain in his flank or abdomen. Doctor advised to immediately go for blood test with a dipstick and an imaging test. 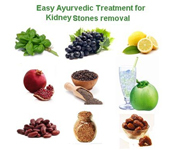 Treatment of Kidney Stones- In most cases kidney stones pass out of the body without any medication or doctor's advice. Stones that cause symptoms or other complications may be treated by various techniques. To treat kidney stones, doctors usually do not use major surgery. In a simple acute attack, many people require medicine for only pain and nausea and lots of fluid. The most common medical treatment is extracorporeal shock wave lithotripsy (ESWL). Through these waves, stones are broken into small pieces. These small pieces can pass out of patient's body through urine. In some cases, a doctor will need to remove the stone or place a small flexible plastic tube (called a stent) in the ureter to keep it open while stones pass. Complications- Usually patient do not have any complication with kidney stones attacks. Rarely, a stone will get stuck in the ureter and cause fluid to back up in the kidney termed as hydronephrosis. If such problem occurs then kidney does not function and lead to a severe infectivity.It can be tested through available radiology tests and these tests can help make the diagnosis quick and prevent long term consequences. Preventing - Effective prevention needed to know that a type of kidney stone patient have and what is causing them. When patient gets a first attack, his doctor advises him to do blood and urine tests and have the kidney stone analyzed. On the basis of test results, patient is advised to change his dietary pattern or medications. Doctors advise the kidney stone patients to drink more water at least 2-3 liters per day. To prevent stones from forming, doctor must determine their cause. He will perform laboratory tests, including urine and blood tests. A simple and important way of life change to avoid stones is to drink more liquids especially water. If there is a tendency to form stones in family, patient should drink sufficient liquids throughout the day to produce at least 2 quarts of urine in every day. 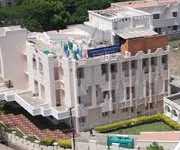 Coimbatore Kidney Centre, 738-B Puliakulam Road, Near Lakshmi Mills, Coimbatore 641 045. Tamil Nadu, India. Ph: 0422 - 4351110. Lalitha Kidney Stone Centre, #24 East End D Main, 9th Block, Jaya Nagar East Bangalore - 560069. Behind Jayadeva Cardologist. Ph: 080-65651555. The Blore Kidney Stones Hospital, 10&11 Vokaligara Bhv Hud Clr City Corp Bangalore27, City Bangalore - 560027, Karnataka, Indiia. Ph: 080 - 22242080. Apollo Hospitals, 21,Greams Lane, Off Greams Road, Chennai-600006, Tamilnadu.Ph: : 044 - 28290200 / 28293333. The Centre of Nephrology at the Apollo hospitals includes some of the most eminent specialists in kidney disease. The Bangalore Kidney Stones Hospital, #10 & 11, Bokkaligara Bhavana, Hudson Circle, City Corporation, Wilson Garden, Bangalore - 560027. Near Coporation Circle. Ph: 080-22226534, 22242080.